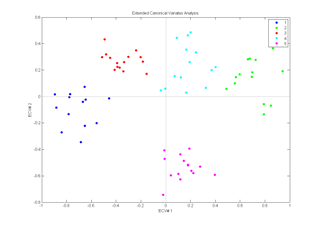 The Extended Canonical Variates Analysis (ECVA) is a new approach to classification. The aim is similar to discriminant analysis but it provides a direct solution to finding multivariate directions that separates groups and simultaneously classifying these. Unlike for example, discriminant PLS, ECVA can also handle situations where three groups are separated along one direction. In general it is found that ECVA provides very stable solutions (classification errors tend not to increase with slight overfitting) that are less sensitiveto irrelevant variables than e.g. discriminant PLS. Example: Samples (n=71) from five different sugar factories are analysed by fluorescence spectroscopy (1023 variables). 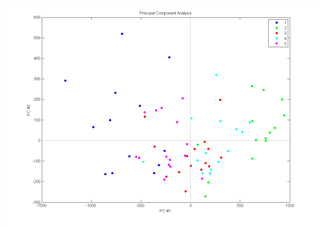 Left part of the figure shows the scores plot from a PCA on the data and the right part shows the canonical variates plot from an ECVA on the same data.